Dressed in tennis shorts and white sneakers, Ernest Porps stands tip-toe and shifts his weight from one foot to the other, as he awaits the beginning of class. In his studio, he moves back and forth from canvas to vantage-point, blending gesture and contemplation into a dance of creation. A dedicated teacher and an inspired artist, Porps’ lifework is a dynamic interplay of intensity and accident, action and meditation. Physical expression was instilled in young Ernie at the age of four, when he began gymnastics training with many other children of German immigrants. Speaking of his hometown Chicago, Porps quotes Carl Sandburg’s reference to the “city of broad shoulders”: a place where a robust young man might follow in his carpenter father’s footsteps. Living within a mile of Lake Michigan, however, he looked out on its vast horizon and became a dreamer. When a friend suggested that they both study architecture at the University of Illinois, Porps fell in love with the design process and working with space. Needing a drawing class to pass the state boards, he went to the Art Institute of Chicago, where he saw a lovely young lady. After she registered, he asked what class she was taking; and when he was told “life drawing,” he signed up too. Although this mysterious emissary of fate never appeared, the teacher brought Porps to an exciting place of unknowing. Although he considered himself totally unable to draw. he pursued a master of fine arts degree. Porps was teaching high school part-time, and its graduation day was the same as his own. The $50 fine levied by the Art Institute for inattendance was formidable. After calculating that he could go to both, he donned a black suit, marched into the auditorium but grew increasingly nervous as it seemed to take forever to get to his name. When it was finally announced, he did a cartwheel with a half twist across the stage, grabbing his diploma, and rushing out the door. A few days later, the dean of the acting school phoned and asked him to teach a tumbling class. This fortuitous event led to a commitment to dance, which he continued to pursue when he came to teach art at the University of Colorado at Denver. The main campus at Boulder had an excellent program, and Porps became an accomplished choreographer and performer. Eventually moving to Boulder, he was drawn to the study of Tibetan Buddhism centered at the Naropa Institute, where Chogyam Trungpa became his mentor in the discipline of flower arranging. Ikebana was an extension of his choreography, with the energy of the plant forms taking the place of dancers. The style of the Sogetsu school encourages the artist to be open to the possibility of unusual materials and to embue plant sculptures with feeling — this is the key to understanding both his philosophy and his painting. In his landscapes, Porps captures the “rhythm of the earth.” Walking in the spaces of the American West, he seeks those vistas which somehow “look back” at him. Taking his camera, he frames a composition intuitively, and the resulting slides are examined on his light table. He lets himself be drawn to a particular image, which will be the starting point for his painting. With no underpainting, the canvas receives brushstroke after brushstroke until the entire surface is covered. During this phase, the artist uses local color, meaning the actual color of the things themselves. Then Porps pushes and enhances the color, while keeping within the bounds of realism. The process becomes one of adding and adjusting, fine-tuning each part with an eye to the sense of the whole. Porps seeks to “match the moment of the universe,” so that his monumental paintings go beyond representing the outward appearance of nature to its spiritual dimension. The title of the painting on the cover, Aspiration, is metaphorical. For Porps, the separation between oneself and what one longs for is the very source of creativity. When one’s mind is open, insight arises — just as Moses went into the “spaciousness” at the top of the Mount and came down with insight. When asked about the large area of white, he responds that the snow is composed of varying shades of greys and blues. The white isn’t the snow — it’s the canvas which has then been shaped with impasto. 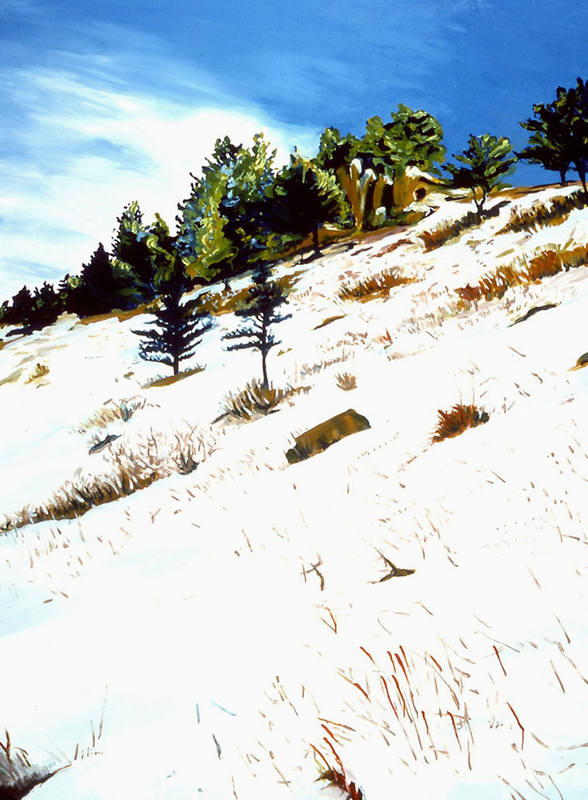 As an experience, the incline is an eruption where the Plains become the Rockies, and the artist’s forceful strokes emulate the life force of nature. You “must get your hands on what you’re looking at,” Porps says. Aspiration is a play on words, because it also refers to an intake of breath. On the cold wintry day, we can almost feel ourselves breathe in sharply, as Porps vividly portrays the feeling of air and light. The bracing atmosphere and sensation of being there makes us feel more alive. Breath is the invisible substance that connects spirit with matter, just as the artist breathes life into his paints. Retired from teaching at 65, Porps is working on a book based on his course on creativity. Using multi-disciplinary and unexpected materials, this class was his passionate attempt to reveal the art in everyday life. For example, in his classroom a skeleton isn’t a model for anatomical study but a prop to show how all architectural form resides in the human body. Expounding on his ardent belief that every personal choice is an artistic choice, he points out that a closet is filled with shapes and colors from which we create our appearance. As a plant may struggle through the concrete of a city street, human beings strive to reach their potential. If you ask Porps, he still hasn’t reached his. Perhaps at his age his mind and body are working in harmony? Without any pretense, he suggests that he has no mastery. He prefers to work tentatively with a “soft heart” letting the process surprise him.